Shopping for your nursery can feel overwhelming. With thousands of decoration options out there, it can be hard to find something unique to fit your vision. We’ve put together some of the cutest, most unique, and customizable items on Etsy that will make your nursery super cute and unique. And we promise, these are quality made from safe materials to keep your baby happy & content. We love these so much we might have to include a few items in our baby and newborn photography sessions at the Rockville, MD studio. And once you have narrowed down your nursery decor, make sure you save space for a beautiful custom portrait of your baby to complement the look! Add an extra layer of safety to your crib with these comfy and cute crib bumpers. They come in fun colors and will keep your baby safe and sound while sleeping. Snag a matching play mat to keep your little one from scratching themselves on your floor. The bumps and rolls in these soft braided mats will massage your baby while they crawl and keep them interested in all their nursery games. Apart from being great nursery decor, a wooden baby activity gym is perfect for development of hand-eye coordination and motor skills. These baby gyms are made of natural grown ash tree and come with a variety of toy options to dangle from the handmade wood frames. These are perfect to set atop the Kika Kids playmates for some extra comfy fun. Every parent needs plenty of baskets and bins for nursery storage. These storage baskets are printed with cute cartoon patterns, and serve as décor for your room while having a large capacity for various household items. Made of dual layer craft paper, they are tough and strong as well as lightweight and foldable. Want to measure your baby’s milestones without getting pesky marker stains on your walls? These Giant Measuring Stick Growth Charts are six feet tall and are fully customizable. Photograph your child in front of this rustic measuring stick to capture their growth for years to come. Want a completely one of a kind play item for your nursery? Each piece of wood for these stacking blocks is hand selected at the company’s local lumber store, cut to size, and the edges are rounded off for safety. Each block is sanded by hand to be perfectly smooth and painted, using only non toxic, water based materials. These blocks act as décor and a play toy for your baby all in one! Minimal and stylish, macrame baby swings add a fantastic touch to a modern nursery design or toddler’s room. The swings are made of recycled cotton rope and the wooden parts are finished with eco linseed oil. Hang the swing in your nursery for a unique boho touch and countless hours of playtime fun. These gorgeous lace and fabric teepees are absolutely perfect for decorating your baby’s nursery or play room. With several designs and colors to choose from, they can fit any room style. Easy to assemble and transport, you can even bring your teepee to the park for a family picnic or on your next vacation. They make a wonderful reading nook and cuddle corner for your little one through their toddler years. Printable art is an easy, affordable way to style and personalize your nursery the way you like it. Flying Elephant Studio has tons of adorable animal prints you can hang or frame in your child’s nursery in any way you like. Choose from elephants and zebras to giraffes and pandas, sleeping on pink clouds or blowing pastel bubble gum. They are a bright and colorful pop to make your nursery stand out. Get your baby’s name cut from wood to display beautifully in your home. Choose from a wide selection of colors and fonts, or keep it classic with a plain wood texture. These are perfect for hanging above your baby’s crib or in the entry way to their nursery. With delicate, shiny and light mobile flying overhead, your baby is sure to be delighted. These neutral baby mobiles come in multiple different styles and were created for those who love nature and animals. Decorate your nursery in gentle, warm tones, and give your newborn a cuddly handmade mobile to look up to as they are being changed or falling asleep in their crib. So you have a baby shower to attend or a baby gift to give: congrats! Baby showers are joyous, memorable occasions that make for a lasting impression on the parents-to-be. We see a lot of new parents and new products come through our Maryland photography studio doors! And we spend a lot of time getting to know our clients and what they love. So we put together a list with a few of our favorites. We hand-picked each item for quality and cuteness levels that are through the roof. While some of these items are just for mama, most will be enjoyed by daddy and baby as well! We want you to be the envy of all the other party-goers by gifting the mama-to-be with one of these special items! Check them out and let us know what you think. Mama will love these adorable monthly milestone blankets from Batz Kids. Allow her to celebrate every month of growth and holiday with the cutest blanket for her little loved one. These will make for the perfect Instagram photo backdrop and provide for the most memorable images! Make sure the mama-to-be gets her rest with the help of the revolutionary baby shusher. It uses a real human voice to lull her baby to sleep with a calming shush. It also has has a timer, volume adjustment, and a removable wrist strap so she can carry her baby while putting her to sleep. You’ll notice that we have one of these magic devices in the studio, and oh my gosh they are so helpful with calming all the sweet newborns that come for their very first portrait session! Every parent that visits our Maryland newborn studio loves it! Who doesn’t love matching outfits? Pick from a multitude of matching tee and onesie combos for the future mama. Colorful, trendy, and comfy, these outfits will be in constant rotation once the new baby is born. Originally made in France in 1961, Sophie has been loved by countless mamas and babies for generations! Sophie is a unique baby teething toy made to stimulate all 5 senses. She is made from natural rubber latex and is soft to soothe those sensitive baby gums. Sophie has other products in her collection too, including rattles, feeding bottles, comforting blankets, and more! It’s a staple in many homes and a great go-to gift. Help mama preserve her memories of the little one to come. These ink and clay foot & handprint kits allow mama to save a part of her baby in the form of an artwork she can keep forever. This is the perfect gift for someone who loves a project and doesn’t want to forget how small their tiny little one ones was. For all the fashion forward mamas out there, this is a trendy gift she is sure to love! It’s great to take a baby-mooon or wear around the pool. These sun hats can be customized with cute quotes and messages and come in a multitude of colors. Create the perfect unique statement piece for mama to wear during baby’s first beach vacation. Once her baby is born and wine is on the menu again, you can bet mama will get a kick out of these. These bottle labels can be placed over a wine of your choice and will provide a good giggle for the new parents during a romantic night at home. Now she can cheers to each milestone with a commemorative photo and a drink! Being a newborn mom is tiring! Treat her to this spa gift set complete with handmade buttermilk soap, a bear bath bomb, diaper rash baby butter, a hand-knitted cotton washcloth, and lavender chamomile bath salts. Her and her new baby will be thanking you for the sacred relaxation time this spa set provides. If mama is expecting a girl, this bow shop is a dream come true. With a multitude of colors, styles and patterns available, mama will enjoy receiving a set of bows to match any outfit for her sweet baby girl. She can even bring a few of the headbands to her newborn photo session! These custom bags are all the rage! Add fun patches and colorful letters to any of their pouches, backpacks, duffels and designs to build a unique bag or accessory for mama-to-be. They are super trendy, versatile, and lightweight to keep Mama organized with a new baby on the go. Gift a pouch with baby’s initials and she is sure to love it! Plus they come in a variety of styles and color options to please even the pickiest mom on the block! For the journaling moms and writers out there, baby milestone books are perfect for remembering every aspect of the first year of her baby’s life. This is a thoughtfully designed modern baby book that mixes journaling with photo memories and record keeping. With a variety of cover designs to choose from (they can be personalized too! ), there is a perfect book in the Print Smitten collection for every mama. We made this really easy for you.. Just shop our favorites below or click the titles above to view the full product collections! I’m so excited to share this fashion cake smash photography session! This was my first time creating a hand-drawn custom backdrop. I love the way it turned out! I don't consider myself an artist when it comes to drawing, so creating this from scratch was stepping outside of my comfort zone. I would love to do more backgrounds like this for my clients to make them truly one of a kind. The subtle fashion sketches in the background were the perfect complement to this beautiful girl in her stylish dress! The cake was delicious, her outfit was adorable, and the whole outcome of this fashion cake smash theme cohesively came together. Cake smash sessions can have themes or be simple. We collaborate with our clients to make them anything you want them to be! We always start with pre-cake portraits. These can be in your favorite outfit for baby or something extra special. 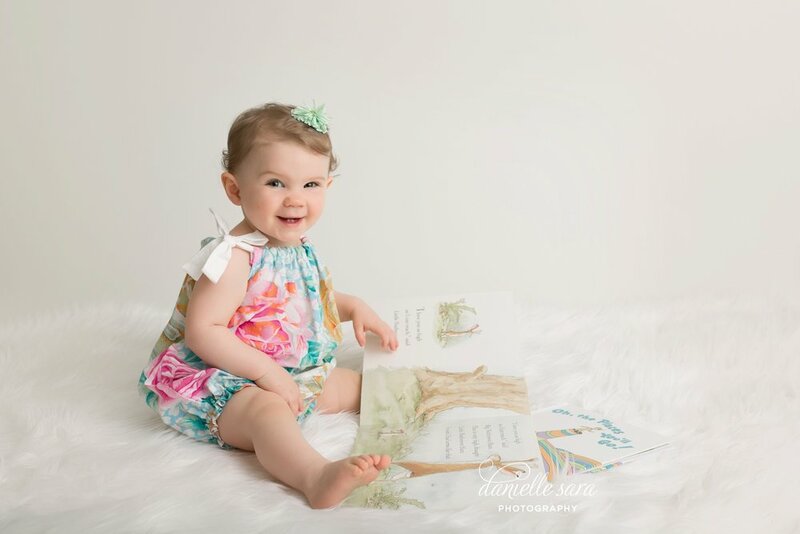 For this session, Mom brought a few favorite books to capture her first birthday milestone portraits. This sweet girl was all smiles when we turned on the music. Her grin and dancing were so cute!! Milestones are so important to capture and look back on with your little ones in the future. We love canvasses, framed photos or albums for one year session keepsakes to show off this once in a lifetime occasion. Cake provided by Sweet DC. Dresses from Little Trendsetter. To plan and schedule your upcoming cake smash call us! We specialize in custom sessions and cute babies. We are excited to plan your cake smash photography session with you and your family! Baby Anna slept so soundly for her first baby portraits. It was unseasonably warm for her session in February so we had to include a little bit of Spring with a pink backdrop. It was a beautiful set up and fit perfectly with the rest of her sweet and simple images. She is such a gorgeous little girl!